28-08-2014 : Counselling dates for TRB PGT Appointment Announced. 25-08-2014 : TRB PGT Exam Selection List of Commerce, Economics and Physics Subjects is published in the TRB Website. 17-08-2014 : TRB has to send the Final Selection List to School Education Department. After that, the School Education Department will proceed for appointment process. 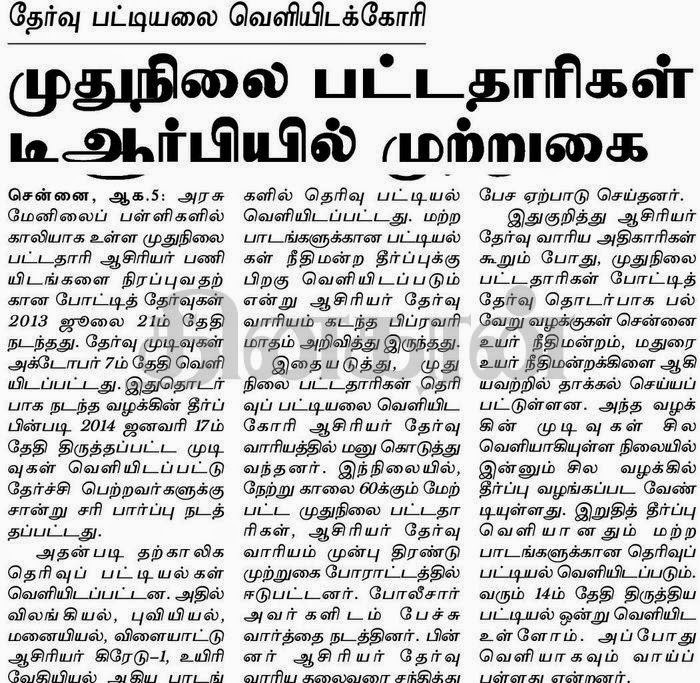 -Today's Dinamalar Newspaper(17-08-2014). 10-08-2014 : TRB Post Graduate Teachers Provisional Final Selection List has been Published Today at TRB Website . 06-08-2014 : TRB Post Graduate Assistants (PG Teachers) Recruitment Revised Examination Results and Provisional List of Candidates for Certificate Verification Published. 15-07-2014 : TRB has informed today (14-07-2014) that the PG TRB Exam Final Results for the Exam conducted on 21-07-2013 will be issued with in one week. According to The Hindu Tamil News Paper, 15-07-2014, the TRB Director G.Arivoli has informed that TRB will soon publish the PG TRB Exam 2013 Results. 04.09.2013 : There are about more than 1000 PG TRB Exam candidates have filed corrections against the PG TRB Exam 2013 question papers. The final answer key will be published at the end of this week. The selected 2881 candidates list for interview also will be published in the next week. TRB PGT Exam 2013 Answer Keys Published in the TRB Website www.trb.tn.nic.in. Click here to download the answer keys. TRB has not released the new updated syllabus for the TRB PGT Exam 2013. There was no announcement from TRB to consider the 2012 TRB PGT Syllabus for this year also. Any how dear all PGT candidates prepare for your TRB Exam based on the 2012 syllabus. We will update when the new syllabus is published. 1.58 lacs TRB PGT Exam 2013 Applications were sold out till date. So candidates, this year PGT Exam will be tough and competition will be more than ever. Be prepared, All the best ! paper of 3 hours duration . TRB PGT Exam will have 150 questions / marks. The question paper will be of objective type with multiple-choice questions. Syllabus of TRB PGT Exam 2013 ? TRB has not published the latest syllabus for the TRB PGT Exam 2013 in TRB website www.trb.tn.nic.in. The application forms issue has been started today 31.05.2013. It is expected that TRB will soon announce the PGT Exam Syllabus for the year 2013. This is the syllabus portions of 2012 TRB PGT Recruitments, Please refer if you want to be prepared. TRB PGT Teachers Recruitment 2013 Applications Issue Date is 31.05.2013 May 31st. Applications will be issued till June 14th 2013. Dear all aspirants of TRB Post Graduate Teachers Exam 2013. Recently, TRB Tamilnadu has announced a written exam to recruit about 3000 Higher Secondary Teachers for Government Higher Secondary Schools in Tamil Nadu. This is the pdf format of TRB PGT Exam Syllabus for all Subjects . Download the file from the following link, if you face any difficulties comment it.